Chart No. 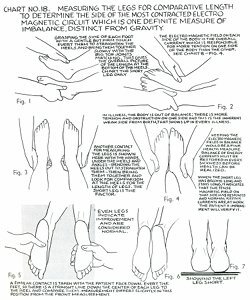 18 - Measuring the Legs for Comparative Length to Determine the Side of the Most Contracted Electro Magnetic [Electromagnetic] Circuit Which Is One Definite Measure of Imbalance, Distinct from Gravity. 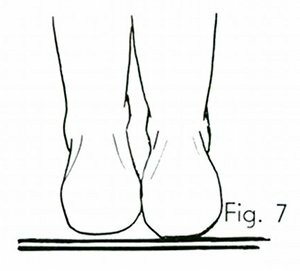 Grasping the side of each foot with a gentle but firm touch evert them to straighten the heels and bring them together slowly with the big toe joints matching. 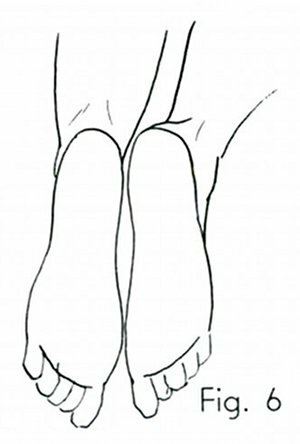 This gives the overall picture of the length at the bottom of the heels. Chart the short leg only. The electro magnetic [electromagnetic] field on each side of the body is the overall current which is responsible for more tension on one side of the body than the other. See Chart 8 - Fig. 4. In illness, the body is out of balance; there is more tension and obstruction on one side and this is the inherent weak side from birth, that shows up in every illness. Another contact for measuring the legs is shown here with the hands under the heels and ankles - bending the heels out to straighten them - then bring them together and look for comparison at the heels for the length of legs. The short leg is the factor. Keeping the electro magnetic [electromagnetic] fields in balance would be a fine health measure. Balance of energy currents must be restored in every sickness before health can be realized. When the short leg has become long and stays long, it indicates that the tense magnetic field on that side has responded and normal repair currents are at work. The patient's improvement will verify it. Even legs indicate improvement and are considered normal. A similar contact is taken with the patient face down. 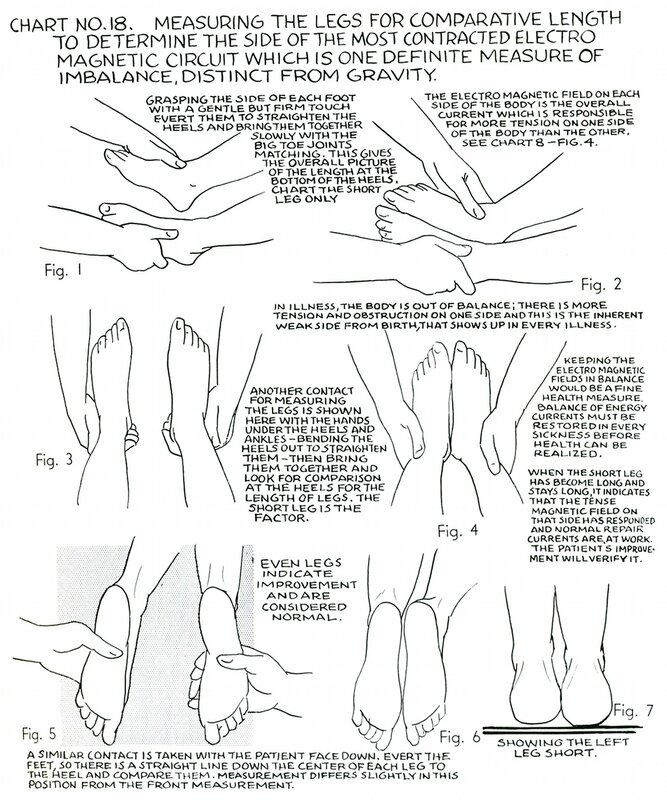 Evert the feet, so there is a straight line down the center of each leg to the heel and compare them. Measurement differs slightly in this position from the front measurement. Showing the left leg short. Book 4, "Comments on Reprint of Chart No.18 from Book II"